When ECE ILLINOIS professor and Beckman affiliate Gabriel Popescu was asked to write a review on quantitative phase imaging (QPI) for Nature Photonics, he knew the significance of the invitation. "I’m very excited about the review," said Popescu. "It means this field, which is new and still emerging, is reaching a certain level of impact and prominence in the biomedical field. I believe that this represents a milestone for our field." QPI is the general term for a modality of imaging cells and tissues and many variations have been developed over the years. "Phase imaging means mapping the delay that light undergoes when it traverses denser tissue, which slows down the light. Quantitative means that we are able to put numbers on it," Popescu said. "It’s like combining microscopy, holography, and light scattering techniques, and being able to do it at the nanoscale." Although some precursors to today’s methods date back to the 1930-1940s—including phase contrast microscopy and holography, which won Dutch physicist Fritz Zernike and Hungarian electrical engineer Dennis Gabor, respectively, the Nobel Prize in Physics—the method has really transformed in the last 10 to 15 years with advancing technology resulting in many new methods with broader applications and nearly two dozen patents. According to the review, because QPI operates on unlabeled specimens, it provides an objective measure of morphology and dynamics, free of variability due to contrast agents. Dyes often can interfere with cell function or, for example, a drug’s effect on the cell. QPI also is complementary to established fluorescence microscopy, resulting in lower phototoxicity and no photo bleaching. "Doing it without labels—the way QPI works—means you can actually image them essentially forever without killing them, and without resulting in photo bleaching," Popescu said. "And on top of that you can do measurements, such as add their masses and see how the mass grows in time, through many cell cycles. So it’s in line with the trend that we see today, including in our new medical school, which is adding quantitative tools to biomedicine to extract objective data ." The review, which is published in the October issue of Nature Photonics, lays out the context in which the QPI field developed, the main principles of operation and representative basic and clinical science applications, and then provides a summary and outlook of the field. 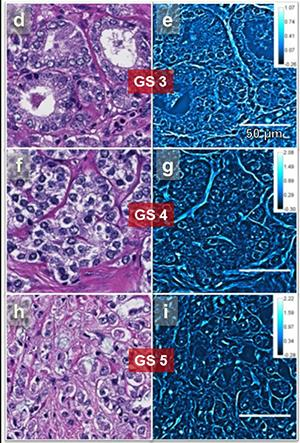 A side-by-side comparison of H&E stain (left) and SLIM (right) images of the same tissue microarray cores show that SLIM images reveal valuable information about the tissue due to the intrinsic contrast. Single strands of stroma stand out in SLIM images as opposed to the uniform pink distribution seen in H&E images. Popescu, the director of the Quantitative Light Imaging Lab, which he founded at the Beckman Institute, is also an affiliate of the Department of Bioengineering and the Micro and Nanotechnology Laboratory. He has been working on QPI since he was a postdoc at MIT in 2002. The applications of QPI are broad. "There are things that you can do with this approach that cannot be done with other methods such as measuring the cell mass and therefore growth," Popescu said. "You can see how this mass changes dynamically with live cells under various conditions. We further applied this to cancer diagnosis and prognosis in pathology slides." "You get information in these tissue slices with nanoscale precision and that information doesn’t exist in regular pathology, especially since it can differentiate between a fast developing cancer versus slower ones. That’s a grand challenge for a lot of cancer types." Popescu has written extensively about QPI and published many research articles on QPI methods. His 2011 book “Quantitative Phase Imaging of Cells and Tissues” was republished by McGraw Hill in 2017 in Chinese and both versions are often used as a textbook on the subject. Popescu selected two collaborators for the review, whom he refers to as "true pioneers in the field from around the globe." Christian Depeursinge, Switzerland, who has been working with this kind of imaging on nonbiological samples since the early 1990s, and YoungKeun Park, Republic of Korea, who was a student at MIT when Popescu was a postdoc there, are co-authors of the review. Note: This is not an exhaustive list, but an attempt to recognize current faculty that have contributed to the development of QPI. Read the original article on the Beckman Institute website.